Motherhood is a wonderful gift and feeding your baby is the most wonderful part of motherhood. If you are breastfeeding, you should take extra care about what you eat and drink as some babies are affected by the mother's food intake. Also, the diet should provide for all the nutrients like calcium, iron, vitamin-C, proteins etc that helps the mother recover from the tedious labor session and also provide for the baby's growth and development. Below are a few foods that may be avoided as it might affect the baby if you are breastfeeding. • Coffee and chocolate: Some of the caffeine from coffee and chocolate ends up in breast milk. As babies can't excrete caffeine as efficiently as adults, it makes them irritable and sleepless. • Citrus Fruits: It is found that certain compounds found in citrus fruits irritate the immature gastro-intestinal tract of the infants making them fussy and causing them to spit up. • Alcohol: Alcohol can cause your baby to be drowsy, weak and make him gain weight abnormally. • Cauliflower: Foods like cauliflower, broccoli and few others that cause gas, causes nighttime fussiness and colic. • Garlic: Consumption of garlic by the mother might make the breast milk have a tinge of garlic flavor which the baby might not like. 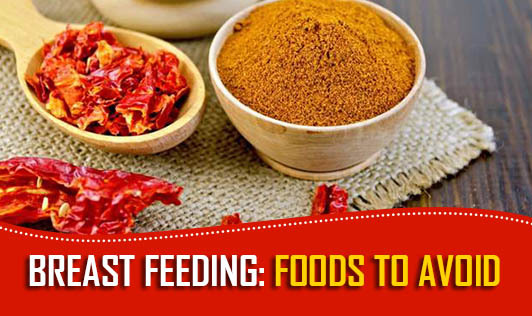 • Spicy food: These may cause the baby to be fussy. • Wheat, groundnuts, dairy products and corn: If your baby cries inconsolably, has stomach pain or has bloody stools, then it might be because of theses food items in your diet. Try eliminating these from your diet and observe if there is any change with the above mentioned symptoms. If your baby is experiencing discomfort while breastfeeding, you can try the "elimination diet". You can start eliminating the suspected food items from your diet to get to the actual food item your baby may be reacting to.